Congratulations to the 2018-19 Ladies League Champions, Flyers who once again have defended the title. The results, league table and averages are all updated with just a few games left to be played, Rafa Rockettes need a draw in their final match of the season to take the runners up spot in their debut season in the league. I'm very sad to have to announce that former Cambridgeshire player, Paddy Reeson has passed away earlier today. Paddy Reeson, guest of honour when the Ladies A and B teams won the 2012/13 Premier Divisions. Paddy served the County as a player, Ladies Captain, Selector and Vice Chairman as well as also being non playing Captain of the England Ladies team. I'm now in my 40th year with Cambridgeshire and there has been some fantastic players in that time and every now and then I try and think who would be in my all time Cambridgeshire teams, it varies from time to time as I remember different players but whoever I think would be in our best team, Paddy is and always will be in that team. She was a fantastic player and more importantly one of the nicest people I have ever had the pleasure to meet and work with. When I took over as Chairman of the County it was a very difficult time for me personally and the County in general and to have Paddy as Vice Chairman was such a massive help and I still think about a lot of the things she advised me on, to this very day. Today is a sad day for her daughter Tina and the family and my thoughts are with them on this terrible day. It is also a sad day for Cambridgeshire Darts as without doubt we have lost a legend who will be sadly missed by everyone who had the honour to have met her. I was once asked to present the trophies at one of the Peterborough Ladies League and Paddy was the winner of the Ladies Singles, whilst I was waiting for her to come up and collect the cup I looked at the cup to see who else had won it and she dominated the league to the point that on that evening she was collecting the trophy for the 30th time. When her name was called out she received a standing ovation from every single person in the packed hall, for me that summed up that not only was she a great dart player but more importantly she was a very nice person. I'm sure tonight will see many more people thinking about her and like Debbie and myself they will have some great memories and stories to tell. She might not be with us any longer but she will be in our thoughts. This is one of the hardest things I have ever had to put on this page, but I hope that every single player who wears a Cambridgeshire shirt this coming weekend in the match against Hertfordshire, whether they had the privilege to know her or just know of her, throws every dart with the determination that she did. The Ladies League is now up and running and there has been good news as Burwell have re-entered the league so there isn't any byes and with the Rose & Crown Manea also entering this season there is six teams in the league. To see all the fixtures, results, averages and tables click on the respective links at the top of this page. Please have a look at the story below as we have been given 50 of the Prostrate Cancer badges to sell , Ian Tilley will be taking them to the Nottinghamshire match on Sunday, it is even more relevant as Martin Adams has recently been receiving treatment for this, but we are delighted to be able to say that Martin has put out the following message after his latest check up, "It's as as close to an all clear as you can get. PSA of 0.1 is as good as it gets. Next visit to hospital is in 6 months." If we can sell all 50 of the badges at the suggested £2 it will obviously raise £100 and if all the BDO Counties do the same it will raise almost £7,000. We realise that many people have already bought a badge from Martin at a recent County match, but maybe some of the Super League players would like to support the cause, Martin also has other information available, please support if you can. 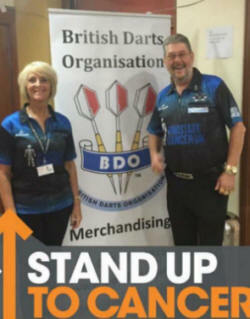 The BDO has joined forces with Prostate Cancer UK to raise awareness of this dreadful disease and our joint aim is to raise as much money as possible for the charity but more importantly to make every man aware of how simple it is to get himself checked out, as all it takes is a blood test. The BDO and Prostate Cancer hope that together we can bring this disease to the forefront and put it on the same standing as breast cancer. If we can achieve our goal and make men aware of how simple the test is then hopefully they will discuss it freely amongst the male population and not be frightened to get themselves checked out. Right now, more than 11,000 men will die from Prostate Cancer; that's one man every hour. 1 in 8 men will be diagnosed with this disease, the majority will be over the age of 50. This is a silent killer as most men don't have any symptoms. The BDO's most prominent player has come forward and put himself as the ambassador for this charity and we are proud to back Martin Adams and show him our support. Prostate Cancer UK badges were handed out at the delegates meeting yesterday and all counties were asked to take a box back with them to sell to their County. The badges have the price of £1 on the packets but we are recommending that people donate a minimum of £2 per badge as every penny raised by the Counties will go straight to Prostate Cancer UK for research and to help families dealing with this disease. Prostate Cancer UK can provide you with all the health information and fund raising support you need to get you started. They can even send a trained speaker to give a talk on Prostate Cancer. For more information please don't hesitate to contact Seren Evans at Prostate Cancer UK: serenevans@prostatecanceruk.org or 02033 107014. Congratulation to the Flyers of : (left to right) Barbara Greatbatch. Jane Judges, Liz Humphries. Diane Nash, Sandra Greatbatch, Amanda Abbott and Sue Edwards on winning the British Champions Cup in Manchester today. The Mens Team of March lost in the group stages. Mens & Ladies Super League Fixtures Issued. Congratulations to Martin Adams on winning the Dutch Open for the Record 4th time today. The new County season starts on Saturday 5th September and we start the Premier Division campaign off with an way match against Lincolnshire. Congratulations to March USC Men who won the Super League on Thursday night in what we believe was the tightest ever finish to a season. They now join Ladies Champions, Cambridge Flyers in representing Cambridgeshire at the British Champions Cup at a venue to be announced on Sunday 9th August, good luck to both of them. 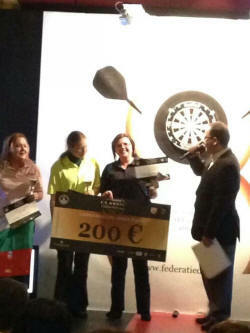 Sandra Greatbatch beat Diane Nash in the final of the Ladies League Singles. Karen Stanhope & Debbie Melton beat Juliet Findley & Carly Chapman in the final of the Ladies League Pairs. Dennis Harbour and Eddie Martin beat Martin Adams and Kelly Corcoran 4-3 in the final of the County play off. On behalf of the Cambridgeshire Darts Organisation I would like to wish all players (youths, seniors, men's and ladies Super League) and your families a Happy New Year. Whilst looking forward I would also like to look back and think of those people we have lost in the last year. Wherever you are tonight have a good one and we look forward to seeing you in 2015. We are very sorry to learn today that former Cambridgeshire player Marjie Lambert has passed away following a short illness. Marjie was a life long member of the County as she had represented the County over 100 times. Unfortunately her husband passed away a few weeks ago so our thoughts are with her daughter and the rest of the family. The funeral will be at King's Lynn Crematorium at 2.30pm on Wednesday 5th November, followed by a gathering at the Locomotive in Wisbech. We are pleased that many other former players will be there on the day, if you know of any former players please let them know as we would love to see as many people as possible there. Mens Fixture are being finalised and will be on A.S.A.P. Steve won the England National Singles title at Hull Arena on Saturday night with a 7-6 win over George Killington (London). In the semi final Steve beat Dennis Harbour. As well as this title the win also ensures that Steve will return to Hull in October to compete in the Winmau World Masters and he will also travel to Selsey as an invited player in the England Matchplay as part of the England Classic weekend in October. As you can see from the Premier Division table above the last match of the season away to Cheshire see's us go into the match with our Premier Division destiny in our own hands. 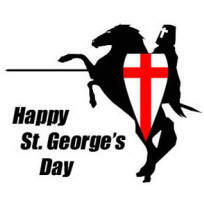 We will endeavour to keep everyone updated throughout the weekend on this page. Last nights Gold Cup Singles winner was Gary Robertson. Ladies Super League Pairs was won by Juliet Findley & Carly Chapman and the England National Singles play off was won by Nadine Bentley. For the first time, this year the EDO have given us an additional free entry as a member of the EDO, the County Executives have decided this will go to the top Lady in the Super League Averages which will be Jane Judges. Congratulations to Dennis Harbour and Derek Clay who qualified for the British Gold Cup Finals with a narrow 4-3 win over Simon Hill and Mark Horspool. Congratulations to Cambridge Flyers who have won the Global Hosts Cambridgeshire Ladies League. This will also give them the opportunity to play in the Champions Cup where they are also the reigning British Champions. The Mens Gold Cup Pairs will be played at the GER on Thursday 27th March instead of the scheduled British Masters (the British Masters has been cancelled by the BDO), more details to follow. On behalf of everyone involved with the Cambridgeshire Darts Organisation I would like to officially congratulate Gary (Geordie) Robertson on hitting a 9 darter in the Global Hosts Cambridgeshire Mens Super League last night. The League has been running since 1975 and this is the first time that anyone has ever recorded a nine darter. Gary hit two 180's followed by 60, 57 and as Gary described "a blind panic lob at double 12". 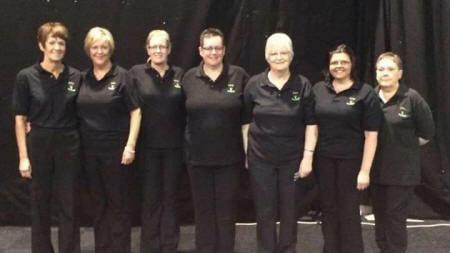 Back Row (L to R) : Jane Judges, Nadine Bentley, Claire Ball, Amanda Abbott, Barbara Greatbatch, Debbie Melton, Amy Grant, Ronnie Johnson & Kerry Brown. The first match of the season has seen us have a 22 - 17 win over last seasons Division One champions, Gwent. There was three draws but a 4-2 win by the Ladies B team was enough to see the bonus points secured. See the overall table and results below. The first match of the new Inter-County season starts today with an away match against Gwent, both teams were promoted back into the Premier Division last season. This see's one major change as the Mens 'B' team matches are now playing the best of seven legs. The Ladies heat of the Lakeside World Championships was played at March GER on Sunday night and the winner was Sandra Greatbatch who beat Barbara Greatbatch 3-1 in the final. Sandra joins Amanda Abbott, Claire Ball, Juliet Findley and Jane Judges to play at Hull. The first set of fixtures will be played tonight, good luck to everyone. The results of all last nights games. the averages and league tables have been updated. The weekend has been a very successful one for Cambridgeshire players. It started off on Saturday when Will Harwood won the Mens Cambridgeshire Open and then on Sunday at the Midland Area Winmau World Masters play-offs, George Belton won the youth boys event and Juliet Findley won the ladies event and so both of them qualified for the World Masters in Hull later this year. The weekend finished off with another win for Martin Adams as he won his second Ranking event in Belgium in the space of two weeks. The results of both last nights two games. the averages and league tables have been updated. There was great news from the Magna Centre, Rotherham, as Cambridge Flyers won the BDO Champions Cup, there were 32 Ladies Champions from across England, Scotland and Wales and after winning all three games in their group (4-1, 5-0 & 4-1), they moved into the quarter finals where they beat the Lancashire Champions 4-1, then in the semi final they beat Dorset 3-2, before completing a great day by beating the Somerset champions 4-1 in the final. This is the third time that the Flyers have become Champions of Great Britain, having previously taken the title in 2004 and 2006, when they were then the Newmarket Flyers. 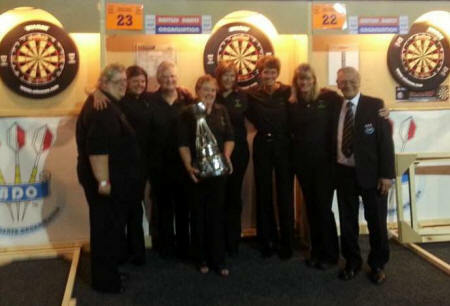 The squad pictured above are (left to right) : Betty Berry, Amanda Abbott, Sandra Greatbatch, Sue Edwards (with the trophy), Jane Judges, Barbara Greatbatch and Liz Humphries, with BDO Treasurer Rod Harvey. The first week of the new season saw both March USC and Cambridge Flyers record convincing wins, click on the links above for full details. Sunday nights AGM's have seen a few changes, in the Mens the teams remain the same at 15, albeit another Wisbech team has entered, with the former Secretary absent, Ian Tilley has taken over as League Secretary. In the Ladies there is an increase back up to 6 teams as a Burwell team has entered. The fixtures for both Leagues will be announced shortly. At the County AGM the only vote needed was for the Selectors and they are : Bob Foster, Sandra Greatbatch, Ronnie Johnson, Gary Robertson and Ian Tilley. Invites are being sent out to selected players and we urge all of them to return their forms asap. The Mens Super League AGM starts proceedings off at 7pm, with the Ladies League at 8pm and finally the County at 9pm. In the Mens and Ladies each team is allowed one vote per team. Congratulation to Ashley Allen, Terry Redhead, Paul Wenn & Paul Woodbine on qualifying for the Midlands Area Finals on Sunday 18th August at Burton Latimer, Northamptonshire. We were very sad to learn that Cambridgeshire youth player Jack Ure was killed in a car accident yesterday afternoon. Our thoughts are with Jack's family at this very sad time. Good luck to Sandra Greatbatch, Martin Adams and Paul Wenn this weekend at the British Pentathlon. Dennis Harbour and Ian Withers have qualified for the Gold Cup Pairs with a win over Mick Reed and Will Harwood. Click on link below for full results. In the Winmau Play-Offs there were only five entrants as (Claire Ball, Jane Judges and Amanda Mallett have all qualified for the World Finals, due to their high placing in the County averages). In the only game that had to be played, Karen Stanhope beat Liz Humphries 4 -3 and Karen will be joined by Nadine Bentley, Juliet Findley and Debbie Melton in the regional finals. Cambridge Flyers completed the double when they beat Cambridge Wanderers 5-1 in the final of the KO Cup, in the semi finals Flyers beat March USC 6-0 and Wanderers beat Rileys Has Beens 4-2. This coming Sunday will be a busy day of darts at the GER, March as the Mens Lakeside Play-Offs get underway at 1pm, entry fee is £5 per player and the winner will qualify for the International Play-Offs in Hull on 9th October. At 5pm the Ladies will play their Super League Pairs (entry fee is £4 per pair) followed by the England National Singles play-off (entry fee is £5 per player), the winner of the England National Singles will qualify for the National Finals which will be played at Pontins, Southport on 13th July. We are pleased to be able to announce the confirmation of the competition dates, the Ladies Lakeside date will be built into the 2013-2014 season, all the competitions will be played at the GER, March. Dates for all the AGM's will be confirmed shortly. Congratulation to Juliet Findley who completed a great double at the County Gold Cup play-offs, she beat Amanda Mallett to win the Singles and partnered Karen Stanhope, they beat Sandra Greatbatch and Betty Berry to win the Pairs. The Gold Cup finals will be played at Lakeside on 29th June. It will be a 8.00pm registration for a 8.15pm start and the entrance fee will be £5 per player. The winner on Thursday night will be entered into the British Pentathlon, which will be played in Tonbridge, Kent on Sunday 16th June, where there will be just 20 players and the entry fee is £110 per player. For whoever wins on Thursday night it will be a memorable occasion. Please tell as many of your team mates as possible and I look forward to seeing as many of you as possible at the GER on Thursday night. Please note that there is a change of competition for Sunday 21st April at the GER. 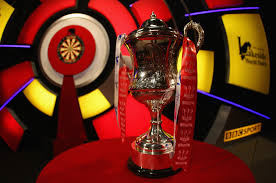 The England National Singles will now be played with the Gold Cup Singles & Pairs being rearranged at a later date. The England National Singles was originally due to have been played in January, but was postponed because we did not know where and when the finals were going to be played, this has now been confirmed by the EDO and it will be played at Pontins Southport on Saturday 13th July as part of the England Masters weekend. Sunday's play-offs at the GER is open to all Super League players who are eligible to qualify in the Winmau World Masters and the Lakeside World Professional. The entry fee is £5 per player, with registrations being taken at 1pm. For every eight players that attend one player qualifies for the National Finals, so if 16 register 2 players go through, 24 players register 3 players go through, etc. Each player who qualifies will receive up to a maximum of £35 towards their travel to Southport and I would like to remind everyone that qualifiers who fail to attend the finals have to return this money and also pay the £40 entry fee that the County has to pay. Furthermore I would also like to remind everyone that it is the responsibility of all losing players on Sunday to ensure that the following match on the board they play on is chalked, failure to do so will mean a ban from future events. If you know any off your Super League team mates who have not got an e-mail, please pass on this message to them. Finally good luck to all those that attend. This coming weekend we play our 8th out of the 9 matches in the Division One campaign when we play our final home match of the season against table topping Hampshire, our final match is against second place Nottinghamshire so two wins would still give us a chance of promotion. Good Luck to Claire Ball, Amanda Mallett and Martin Adams who are all in the England squads for the British Internationals in Scotland this weekend. The overall score was Staffordshire 14 Cambridgeshire 25 a fantastic win, well done all. 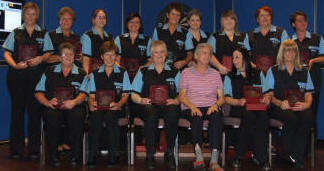 The Ladies A team won 4- 2 with Amanda Mallett taking the Lady of the Match Award with a 25.05 average. CLICK HERE to see the Match Sheet. We are very pleased to announce that Claire Ball and Martin Adams have retained their places in the 2013 England squad and they will be joined by Amanda Mallett who has received her first call up. We wish all three of them well in the British Internationals which will be played in Scotland on the 5/6/7 April. The County would like to send best wishes to John King (former County player from March) who was involved in a serious accident last Friday. He is currently in Addenbrookes Hospital receiving treatment for serious damage to both his legs. We are sure you will join us in sending him our best wishes and hope that he makes a full recovery and is back on the dartboard soon. We were sorry to hear that Betty has recently passed away, she played for the County in the 1970's and was playing for Peterborough in the Super League in the early 1980's, our thoughts are with her family. We heard recently that Terry has just come out of hospital in Scotland where he now lives, after an operation for cancer. Terry played Super League for Cambridge, represented the County for many years and was one of the first players from the County to represent England. Initial signs are good for Terry and we wish him well in his recovery. The mens play off due to be held on Thursday night has been postponed due to technical reasons. A new date will be picked and we will let everyone know asap. Please let any mens Super League players know. The BDO Lakeside World Professional Championships starts at the Lakeside Country Club, Frimley Green, Surrey today (Saturday) and we would like to wish Martin Adams the very best of luck as he attempts to win the title for a fourth time. Martins first game is on Sunday afternoon when he takes on Jimmy Hendriks, who is the reigning World Cup Youth Champion, from Holland. Selected matches will be shown on BBC, whilst further coverage is available on ESPN (£10 for a month). You will also be able to follow all the scores on Darts For Windows. You can now buy everything you need for your darts from the Cambridgeshire Darts Organisation Online Shop, just click on the logo below. you can get everything you need and you will also be helping the stars of tomorrow. We are sad to report the passing of former County Player, John Green. John was 74 and passed away recently. John played for Wisbech in the Super League and was a regular in the Mens A team in the late 70's and early 80's. Our thoughts go to his wife Miriam and their family. John's funeral will be at the Fenland Crematorium on Thursday 11th October at 12 noon, family flowers only. The Mens Super League Pairs will be played at the March GER Club tonight. This coming weekend (8th & 9th) will see the start of the 2012-13 BDO Inter-County season and we start the new season in Division 1 following our relegation from the Premier Division at the end of last season. Our opening match is at the GER Sports Club, Robingoodfellows Lane, March where we will face a multi talented Gwent team that contains many current and former Welsh Youth and Full Internationals. The starting times are 12 noon on the Saturday for the ‘B’ teams and 11am on Sunday for the ‘A’ teams and admission is still just £4 per person, payable at the door on the day. You can get updates from the County match against Gwent over the weekend. It will be a chance for a competitive match before we face Gwent next weekend. 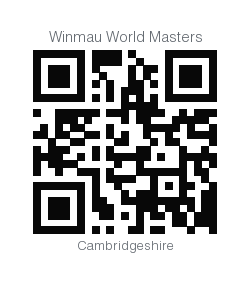 It was another case of runners-up spots today at the Midlands Area of the Winmau World Masters Play-Offs. Daniel Curtis (Youths), Ronnie Johnson (Ladies) and Paul Wenn (Mens) all lost in their respective finals to qualify for the Winmau World Masters finals. March USC ladies (pictured below) just missed out on a place in the BDO Champions Cup finals as they lost 2-3 to the Norfolk Champions in the regional final played in Chelmsford today. They had beaten the Suffolk Champions 3-2 in the semi final after beating hosts Essex 3-2 in a preliminary round. Our Men's Champions, Comrades A, were missing several players and lost 3-6 in their semi final to the Suffolk Champions. Ladies don't forget tomorrow is the County heat of the Winmau World Masters at the GER Club, register at 6pm, the entry fee is £5 per player, four players will qualify through to regional play-offs on Sunday 22nd July 2012 at The Rolls Royce Gate One Watnall Road, Hucknall, Nottingham, NG15 6EU. Good Luck to everyone tomorrow, two players who will not have to play tomorrow night are Claire Ball and Sandra Greatbatch who have already qualified for the World Finals to be played from the 11-14 October. Sandra qualified by finishing third in the British Grand Prix Table, whilst Claire qualified from the Inter-County averages. There is more good news as Dennis Harbour has also qualified for the World Finals via the County Averages. The Mens Super League AGM will take place at the GER Club March on Thursday 12th July at 8pm. Any new teams interested in joining the League for 2012-13 should be at the meeting. For more information call 07968 490683. The County Youth team are playing their final match of the season at home (GER Sports Club, Robingoodfellows Lane, March) this coming Sunday, 13th May. They are playing Bedfordshire and I'm sure they would appreciate your support. 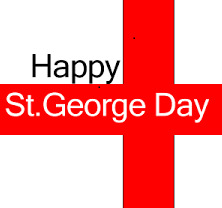 Doors open at 10.30am, Play is due to get underway at 12 noon ish and it is just £1 per person to enter. The final match of the season saw us lose 17 - 22 to Essex and confirm our relegation to Division One next season. Congratulations to Claire, Martin, Peter & Ian on a very successful weekend in Wales. We hope to bring you updates from the County match against Cheshire over the weekend. We hope to bring you updates from the County match against Kent over the weekend. We would like to congratulate Claire Ball and Martin Adams on their selection in the England Squads to play in the 2012 British Internationals. Martin will be adding to his record total of England caps, whilst Claire will be joining the squads for the first time.